Save Marinwood-Lucas Valley - our community, our future: Seattle Mayor holds on for his political life and withdraws proposal to eliminate Single Family Home zoning. 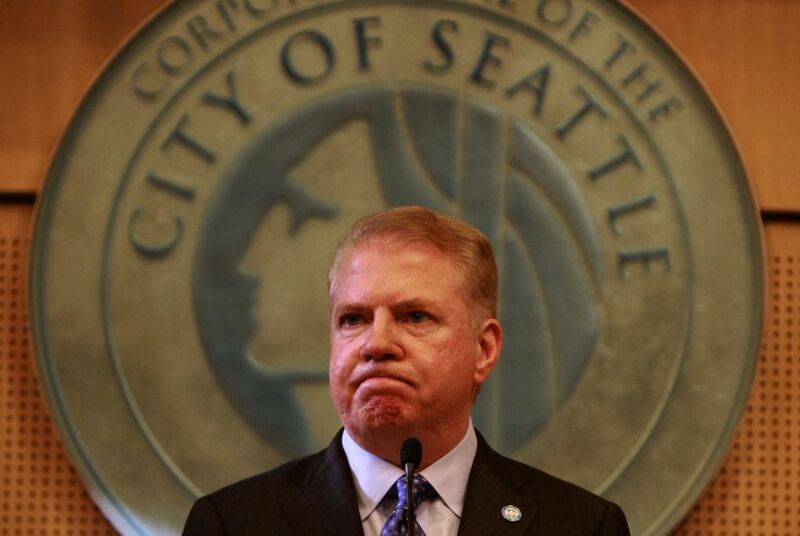 Seattle Mayor holds on for his political life and withdraws proposal to eliminate Single Family Home zoning. Seattle Mayor Ed Murray made a U-turn Wednesday on a controversial aspect of his new housing-affordability plan. Seattle Mayor Ed Murray said Wednesday he’ll no longer seek to allow more types of housing in the city’s single-family zones, after all. Permitting duplexes, triplexes, stacked flats and other multifamily structures in those zones was perhaps the most controversial of 65 strategies recommended earlier this month by Murray’s Housing Affordability and Livability Advisory (HALA) Committee. Murray defended the proposal at a July 13 news conference where he unveiled the recommendations that together make up his new housing-affordability plan. City Council President Tim Burgess and Councilmember Mike O’Brien, the council’s land-use committee chair, stood with the mayor at that event. But both have since come out against the proposal to change all of Seattle’s single-family zones. Zoning modifications must be approved by the council. “The Council and I created the HALA process because our city is facing a housing affordability crisis. In the weeks since the HALA recommendations were released, sensationalized reporting by a few media outlets has created a significant distraction and derailed the conversation that we need to have on affordability and equity,” he said in a statement Wednesday. Some, though not all, of the controversy around the mayor’s proposal for single-family zones focused on him and his 28-member volunteer task force framing the changes in terms of race. That language and similar remarks by the mayor stirred debate over the relationship between the city’s single-family zones and ongoing racial segregation. “We also must not be afraid to talk about the painful fact that parts of our city are still impacted by the intersection of income, race and housing,” Murray said in his statement Wednesday. Murray, the HALA Committee and other proponents of more density argued that allowing more housing types in single-family zones would increase the overall housing supply, a key to making the rapidly growing city more affordable. They noted height restrictions in those zones would remain the same. “Fundamentally, this is a conversation about building a Seattle that welcomes people from all walks of life — where working people, low-income families, seniors, young people and the kids of current residents all can live in our city,” the mayor said Wednesday. But some homeowners raised concerns about the changes encouraging developers to tear down bungalows and thereby alter the character of neighborhoods. They wondered whether the new homes would actually be affordable. Toby Thaler, a Fremont Neighborhood Council board member, called Murray’s about-face a good step. “But the real problem is a failure to have an inclusive process that empowers all stakeholders,” Thaler said. Alan Durning, executive director of the Sightline Institute and a HALA Committee member, said the mayor is “trying to quell the furor” in some neighborhoods. “I’m disappointed the mayor has folded so quickly, but I’m not terribly surprised because the political blowback has been so intense,” Durning said. Faith Pettis, a Seattle lawyer whose work includes housing-financing and who co-chaired the HALA Committee, said she’s disappointed by Murray’s move. “I believe we’ve lost an opportunity to do something that would really help this city in the long term and that people would ultimately be comfortable with,” she said, pointing out that Portland has much, much less land that is zoned single-family. Pettis said too much attention was paid to the panel’s recommendations for single-family zones and not enough on proposals the mayor hasn’t abandoned, such as requiring developers in multifamily zones to pay a fee or build affordable housing. Robert Cruickshank, onetime aide to former Mayor Mike McGinn and senior campaign manager at Democracy for America, said Murray and his allies didn’t line up enough grass-roots support ahead of time. “The way this was announced I think set it up to fail,” he said, noting the HALA Committee’s work over many months was carried out in private other than a draft report leaked to Seattle Times columnist Danny Westneat. The HALA Committee recommended that officials relax restrictions on mother-in-law units and backyard cottages, which already are allowed in single-family zones. The mayor also will no longer pursue that goal, according to a spokesman. But O’Brien still supports the idea. “I remain committed to exploring ways we can encourage more use of mother-in-law apartments and backyard cottages,” O’Brien said, suggesting the council could take up the issue in early 2016. Murray said he intends to refocus the discussion on density and added affordability housing in Seattle’s designated Urban Centers and Urban Villages and along transit corridors. His plan also calls for upzoning 6 percent of the city’s land that’s currently zoned single-family.